One of the biggest mistakes during my pregnancy has been going gung-ho purchasing maternity clothes in early pregnancy before I could try them on and fill them out. I got a lot of these pieces super-cheap by purchasing summer maternity clothes during the winter. But now with only about six weeks left in my pregnancy, I have maternity clothes in my closet that still have the tags on them. A lot of maternity clothes are meant to fit all size bumps, which doesn’t mean it’s going to fit your bump well. Plus, some maternity clothing stores make all their dresses way too long (think calf length), which is not flattering unless you’re six feet tall. Here in the home-stretch of pregnancy, I find myself wearing hardly any maternity clothes. Today’s styles are very forgiving, and allow room for a bump, even a 34 week bump like mine. And I feel so much better about buying clothes that can be wore postpartum. 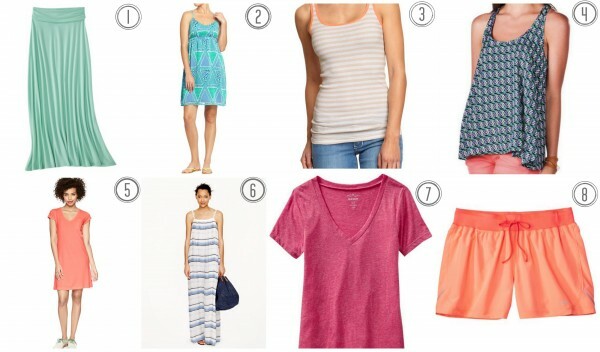 So I thought I’d share my tips for how to wear non-maternity clothes when pregnant in the summer. Maxi skirts are a God-send. They’re as comfortable as pajamas and don’t require that you shave your legs. I like the kind that fold down the best, but as long as they have an elastic waistband, they work by putting the waist band under my bump. Maxi skirts are also adjustable for different heel lengths. With a fold down waist, just fold it down more to make it shorter, or less for higher heels. With my elastic waist bands, I fold the waist when I wear flats. This obviously won’t work if you tuck in the shirt, but who tucks things in when you’re pregnant? I have two maxi skirts that have gotten me through pregnancy, both found at Gap Factory Store. One was in the Gap Lounge section. Depending on the fullness of the skirt, these may get you through the majority of your pregnancy or your entire pregnancy. Empire waists are definitely the most flattering waistline on bumps. A-line and dropped waists just look silly. I already had a few in my closet that worked from Francesca’s Collection and my favorite Charlotte Boutique, The Boulevard at South End. However, I got really lucky and found a few more at Old Navy on the clearance rack. They were online only purchases, so when a person brought them back to the store, they had to mark them down to 50% off. So I got them for $10 a piece! I also recently found one at J. Crew during a really fabulous sale. I love these! I have ribbed ones for working out and have actually been able to wear a lot of the ones I already owned that are a tad less casual with skirts and shorts all summer long. As long as they have some stretch, you’re good to go. If you’re afraid that they’re not quite long enough, layer over a longer maternity cami. I bought a slew of these from Old Navy when I decided that I didn’t like any maternity workout clothes. I was looking through the comments and ratings for several different types of tanks and someone had commented that these got her through her pregnancy. I immediately bought five. They’re so cheap, especially if you catch them on sale. As for the ones you can wear to a casual dinner or somewhere besides the gym, I had several tanks from J. Crew Outlet, the Limited, and Banana Republic that I’m still wearing Any tanks you have that have some stretch and are long will probably work for you. I love the trendy blousy shirts that are so popular now and wear them often. I recommend trying these on and not purchasing them online because you never know how blousy they actually are on those skinny models. Blousy shirts are meant to be worn with more form-fitting bottoms so here’s where you might have to purchase some maternity clothes. I wear mine with maternity skinny jeans, maternity tights, and sometimes even maternity shorts if the shorts are long enough. Forever 21 has some great blousy pieces and they’re very inexpensive. I also found some at Buffalo Exchange, a chain consignment store on both the East and West coasts. And then, of course, I already had some in my closet. These might not get you through your entire pregnancy unless you perhaps buy a size up and they definitely need some stretch to work. To define your bump more, use a skinny belt that fits well. I bought a few size large skinny belts in order to have plenty of room to grow while still being able to have plenty of belt left over to tie into a trendy knot. Maxi dresses are my favorite style that works for pregnancy because they can be dressed up or down and are just so effortless. I didn’t purchase any maxi dresses last year when they became so popular, but I went all out this summer. You want to make sure that, just like with regular dresses, that the maxi dress you purchase for pregnancy either has no defined waist or an empire waist. You never want a waist that hits you at your largest point (mid belly). It just looks weird. Where didn’t I find them? I found them at consignment shops; mainly the Clothes Mentor on Kings Drive in Charlotte. I found them at J. Crew during their awesome summer sale. I found them on Groop Dealz (they have cutes ones almost every week). I found them at little boutiques. I just bought one a few weeks ago that I plan to wear at one of my showers at Fedora in Wilmington. I plan to wear another one to another shower. They’re just perfect in every way. These work very similarly to the long tanks, except I tend to wear these around town instead of working out. I wear them with maternity jeans, maxi skirts, and elastic waistband skirts. In my opinion, the best places to get these types of T-shirts are Old Navy (the Vintage collection), Gap and Gap Outlet (Favorite Tees), J. Crew, and J. Crew Outlet. They’re obviously cheapest at Old Navy, but you can find good deals at the other places too. These are all-around great to have, pregnant or not. The selection of maternity workout clothes is just sad. And most stores charge about double what I pay for my workout clothes (says the girl who won’t step a foot in Lululemon). So I threw up my hands a long time ago and took my bump to Target, where I purchased a size up in shorts with an elastic waistband. I purchased the size up so the waistband could easily be folded down below my bump. Works like a charm. Target, of course. I tried on some at Old Navy too, but found them to be much too short for my taste. I actually can still wear a lot of my more forgiving running shorts too, with the waistband below my bump. Brooks running shorts have worked better than Nike for some reason. I have a few of these too that I found at consignment stores and Target. But have relied less on them because they’re more difficult to find. I wear my leggings periodically with tunics, but tend to wear maternity leggings more. However, it’s hot in NC so I’d rather have my legs free than cloaked in black cotton. You can find a good pair at Motherhood, and definitely get the calf-length for the summer. I don’t wear these much now because it’s too hot to wear 3/4 or long sleeves, but in cooler months, these are necessary. They’re also necessary if you work in a traditional office setting. You can use them to cover your arms in one of your non-maternity tops or dresses. I have made due with two bras in a size up with no underwire. For the past four months, underwire has made me want to take my bra off no matter where we are. Rather than purchase maternity underwear, I find that hipsters work great. They hit lower on your waist so they don’t get in the way of your belly. I’ve bought at least 15 pairs from Target (which I surprisingly like more than Victoria’s Secret when it comes to hipsters) over the course of my pregnancy. So cheap! These tips and recommendations may not work for everyone. If you have a larger belly, these strategies for wearing non-maternity clothes may only work for part of your pregnancy. But even still, I would wait and purchase your maternity clothes when you get to the point where you actually need them and use these strategies in the mean time to get you by. Look out for my follow-up post on maternity-wear that I actually did purchase and wear, as well as my favorite places to find great maternity-wear. What about you? How did you get through your pregnancy with style? I know my tips work for my body type (petite), but I’m sure others could benefit from suggestions for different body-types. I often find that the comments section of these types of posts are better than the posts themselves, so please comment away!